Congratulations and welcome to FedUni! If you are planning to defer or decline, please see our Deferring or declining your offer page for further information. Accepting, deferring or declining your FedUni offer is done via our online student management system - my Student Centre (mySC). You can log in to this system using the user ID and password provided for you in your offer letter. If you have difficulties logging in, please contact our IT Service Desk. 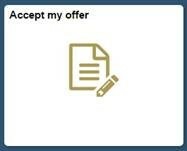 Click on the 'Accept my offer' tile at the bottom of your my Student Centre home page, and select your preferred option. Note: TAFE program offers do not include the option to defer. Important: Prior to completing your enrolment checklist and enrolling in to your classes, please ensure that you have accepted your offer and allowed at least 24 hours for our system to activate / update your student account.